Twist open pen measures appx. 5.5" long. Gunmetal hardware. Standard Parker ballpoint refill. Bats used to make these pens are game-used from various levels of play...youth to pro ball. Ash wood bats are repurposed to take on another life! (No COA is included.) Each pen is individually hand turned and finished! 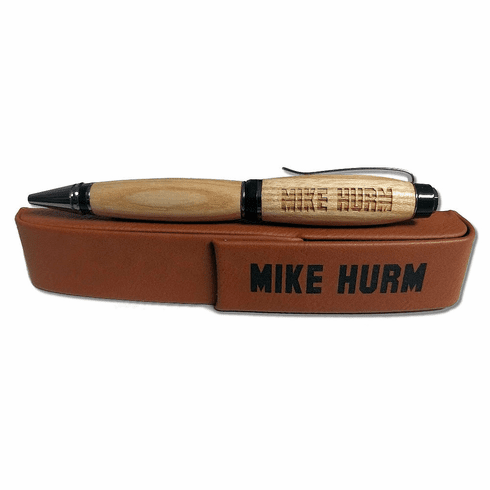 Synthetic leather pen box is included - personalized with the same text as your pen. ~ Perfect graduation gift for the baseball seniors! ~ Great gift for your baseball coach! ~ Awesome gift that will be used daily for anyone who loves baseball!